It is demonstrated that the fundamental economic cycles of the world are based upon the cycles of the planets as is the timing and magnitude of the sunspot cycle and the also the changes in the earth’s climate which are at the foundation of the world’s economic cycles. It also shows that even though all of these cycles are linked the cycles of the sun are not the causes of the world’s economic cycles, but rather the cycles are driven by the changes in the electromagnetic climate of the solar system that appear to be associated with the interactions of the planets. As a final observation the people have always looked to the sky to try to figure out why changes are occurring on the earth. Until the present time it has been nearly impossible to correlate any astronomical events with events on the earth. Now we can see that indeed the planets affect events on the earth in an extremely profound way. The Cattle Cycle drives most of the other economic cycles of the world and the stresses placed upon the system result in wars, famine and disease. All of these changes may be ameliorated by being able to predict what these changes will be in the future and to adjust the various markets to better handle the cosmic changes which are at the foundation of the entire system. His cattle cycle, by the way, had to do with beef prices and stock numbers - which are affected by earthly factors rather than celestial ones (see here and here). Synchronicity or Astrology? - Brian T. Johnston, BSc. From HotWhopper - An economist should know better, maybe ...but what about Anthony Watts? Most of the people commenting were not quite as impressed as Anthony Watts. Had they been asked, most probably would have suggested to Anthony that it was going a bit too far, even for WUWT. Although they don't complain about Tim Ball's fanciful if paranoid conspiracy theories, so maybe not. If you look at the cattle price graph, above, you can see that the peaks are related to periods of higher fuel prices, 79 end of the Carter Years, 91, Kuwait and Desert Storm, 2005 Katrina, et al. Cattle price fluctuations have always been tightly linked to the cost of production inputs, particularly diesel. So it’s odd that the position of two very large planets should be so closely linked to the cost of diesel fuel. Can’t speak about planets and orbits with any authority, but the the circuit shown is either incomplete or makes no sense at all, and the explanation of transistor operation, bases, emitters, collectors, and vacuum tube details and theory of operation are infantile and often … confused. This sounds a lot like Post Hoc Ergo Propter Hoc to me in a number of areas. Of course, if you can distill this into a thing that will make predictions and those predictions are validated, you are doing a lot better than all the GCM models flying around. The hypothesis that the solar magnetic field effects the temperature of the earth seems to be not disproved, but beyond that I think that there is a need to formulate a prediction model (even if only on a statistical basis) and then test against the future. Color me agnostic till then on the J-S effect. “Truth is what works.” – William James. 40 years ago, when I was in the 9th grade, I had football coach teaching the health class I was in. He taught us about biorythms, like it was established medical-physical fact. We all unquestioningly lapped-it-up since it must have been true , coming from our teacher. Pure bunk presented as established incontrovertible fact. The 1970’s was a decade full of BS pseudoscience. Society and societal norms were in turmoil after a dozen years of sexual revolution, anti-war activism, declining family values. People were looking desparate for meaning in their lives. I can just imagine that is what is happening in today’s high school biology and ecology classes vis-a-vis climate change alarmism. The 2nd decade of the 21st century seems to also be a decade of pseudoscience. Social norms are in turmoil and people are searching for some mystical meanings, hidden from view, in our short lives. Biorythms in 1975. Climate change-Save Gaia with carbon taxes in 2015. I agree to a point that the article is a bit like trail mix but then again trail mix is good for you when you are on the trail, certainly better than the peanut butter and jello sandwich that mainstream climate science is serving up. One wonders why ntesdorf visits the blog that claims it's ".the world's most viewed climate website"
When I saw the phrase "Cattle Cycle" all I could thing of was the the Sheep Albedo Feedback. Watts has lost it. He's scraping the bottom of the barrel for topics. Or, the declining Alexa ranking could just be because not as many of the current Wattsian sycophants has the Alexa toolbar installed as did in the past. Although... Alexa did recently change the way they compiled their rankings, to try to mitigate the toolbar self-selection effect, didn't they? I followed the alexa link you posted and did the same for blog.hotwhopper.com ... It came as no surprise that since this site is a parasite of WUWT, it's expected that you'll be so much smaller. Weird, really weird. But, come to think of it, don't WUWTers realize all seemingly random events not explained by traditional horoscopes are caused by asteroid perturbation effects? For $100 I'll provide personalized corrections (cash only, no returns). Sad to be reminded time and time again of those with such skewed intellectual capacity controlling very visible aspects of important public discussions. 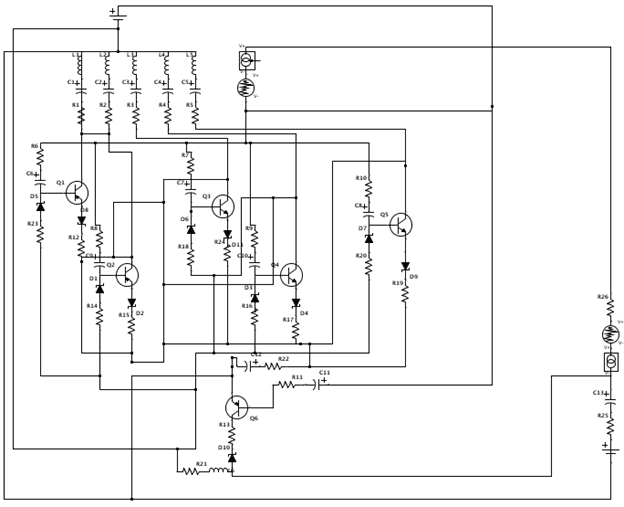 I have forgotten more electronic theory than I care to contemplate but that circuit diagram looks like complete nonsense to me. Then again I could be mistaken as it is meant to be an analogue circuit of planetary cycles affecting things on Earth. This theory of planetary cycles of course is complete nonsense so perhaps it is a true representation! Bert, B. Ap. Phys. ; P. P. E.; C.W. Y.; AAP; BBC; and to many more to quote. yes the guy is way out there, wacky. "The Relationship between the Day of Birth and the Day of Death and Solar Aspects"
"Planetary Aspects and Terrestrial Earthquakes"
And this is why WUWT is only of psychological interest, in the Lewandowskyian sense. "Brian Johnston has been involved with mysticism for over forty years. He has studied with the Rosicrucian Order and attained the Twelfth Degree and became an Illuminati of the Order and has also been a practitioner of the Toltec system since 1969. He began studying Don Juan and Carlos Castaneda at that time and has applied the principles associated with this work since then. He is also an expert astrologer and became widely known around the world for his work into astrological research. In this regard he was able to demonstrate a statistical link between the aspects of the planets and the rate of earthquakes on the earth. He has published many articles in the International Astrologer and in Horoscope Magazine. He was a member of the International Society for Astrological Research for many years. Brian is also an advanced amateur astronomer and has been president of the Pine Ridge Astronomical Society. He was also Master at the Rosicrucian Pronoas in Peterborough, Ontario, Canada." The 60's produced quite a few of these characters; we used to refer to them as 'Acid Casualties'. Castaneda is a dead giveaway. So, is this the bottom of the barrel, do you suppose, or will Willard Anthony's panic see him desperately scramble down even further? Inquiring minds want to know. Anthony'd run out of freebies is my guess. It's only the second of two articles in the past 24 hours and the third in two days, and the other one was an Eric Eugenics Worrall bit of huffery puffery fairy floss. For someone who usually needs to churn out somewhere between 3 and 8 articles a day to keep his visitor numbers up, that's not many. If he can't get any more contributions he'll have to resort to digging up a press release or two, to "claim" scientists don't know nuffin'. Or, heck, he might actually write something himself - which would be a sign of true desperation. Of course he could recycle something he's printed before. His readers rarely notice when he does that from time to time. It is of course amusing that the author is an astrologer and an mystic, but besides that, is this article really any different from other mathurbation at WUWT? If Anthony is going to publish this level of stuff then we can look forward to Poes appearing at WUWT, not just as comments, but as articles. Maybe he's preparing for The Woo Boat. "Our “Conspira-Sea Cruise and Seminar-at-Sea” takes place right on our luxury cruise ship during our seven-day cruise, in conference rooms on the ship, and during our port calls in Mexico. GMOs, Monsanto, bee colony collapse, ecology, global warming, climate change, fracking, HIV, autism, etc, etc, et c, etc............."
Leif Svalgaard reminds me: Did Watts ever do a "claim"-post on the study¹ Svalgaard co-authored, and which essentially demolished the deniers "it's the sun" zombie-meme? Might be he never dared, since he would a) lose his only reputable scientist reader, and b) get his arsaz served on a platter, intellectually speaking of course. As an astrophysicist I have to say; WTF!